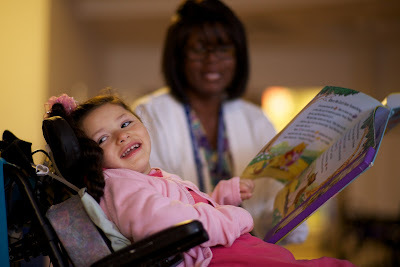 There’s nothing wrong with Hamda, explained Stephanie Bailey, a member of the recreational therapy staff at St. Mary’s Home for Disabled Children. She’s just maybe a little different from you, Bailey told the boy. She’s been doing that a lot lately. The recreational therapy staff has been organizing weekly field trips for 7-year-old Hamda, such as a shopping excursion to pick out a new winter coat and the recent journey to the library. Her constant companion on the outings is Gwen Dickens, a certified nursing assistant. Dickens has worked at St. Mary’s Home for 36 years, most of those years on the night shift. About three years ago, she switched to the 7 a.m.-3 p.m. shift and was assigned to Hamda’s room. Dickens has made it her mission, in addition to her regular duties, to make Hamda happy — and she’s succeeded. The two have grown extremely close as they’ve established a comfortable daily routine centered around talks, walks throughout St. Mary’s 88,000-square-foot building and story time, with Dickens reading books that Hamda chooses. Hamda didn’t smile much at first; now she smiles a lot as a way to express herself, especially when Dickens is around. “This is a special place and when you see a child’s accomplishment, it does your heart good to know that you have contributed in some small way to foster that accomplishment,” Dickens said. Hamda (and Dickens) will be going back to the library soon. Hamda’s even applying for her very own library card.